State Rep. Tommy Sankey (R-Clearfield) was sworn into office Tuesday at the state Capitol to officially begin his first term in service to the constituents of the 74th Legislative District. Sankey is one of 10 Republicans in a 29-member class of first-term representatives in the 197th session of the Pennsylvania House of Representatives. 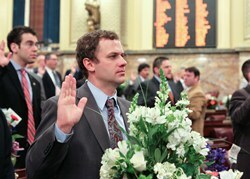 HARRISBURG – State Rep. Tommy Sankey (R-Clearfield) was sworn into office Tuesday at the state Capitol to officially begin his first term in service to the constituents of the 74th Legislative District. Sankey is one of 10 Republicans in a 29-member class of first-term representatives in the 197th session of the Pennsylvania House of Representatives. Sankey will soon be opening his primary district office, which will be located at 315 East Market St., Suite 100, Clearfield. Sankey’s toll-free telephone number is 1-866-901-2482. His constituents may also contact him via email at Tsankey@pahousegop.com, through his website at www.RepSankey.com, or by visiting his Facebook page at www.facebook.com/RepSankey. The 74th Legislative District is made up of the following Clearfield County municipalities: the townships of Beccaria, Bell, Bigler, Bloom, Boggs, Bradford, Burnside, Chest, Cooper, Covington, Decatur, Ferguson, Girard, Goshen, Graham, Greenwood, Gulich, Jordan, Karthaus, Knox, Lawrence, Morris, Penn, Pike, Pine and Woodward; and the boroughs of Brisbin, Burnside, Chester Hill, Clearfield, Coalport, Curwensville, Glen Hope, Grampian, Houtzdale, Irvona, Lumber City, Mahaffey, New Washington, Newburg, Osceola Mills, Ramey, Wallaceton and Westover.